Our 10-year blogiversary celebration sale continues this month! This week, I want to highlight an item from my shop you might be interested in for your group classes or summer music camps. There’s also some freebies linked to below…keep reading! The Great Composers & Their Music series is designed to be an easy and effective way for teachers to incorporate music history in their students’ musical education. Here’s the story of how this curriculum came to be. 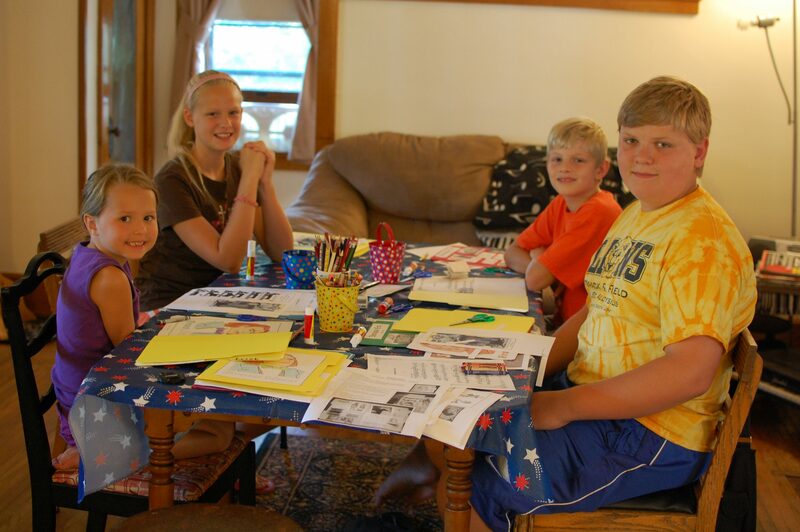 In the summer of 2012, I decided I wanted to offer a music history camp for my students. It’s not easy to cover music history thoroughly during the private lesson setting, but I wanted my students to know the major composers and the style periods. Knowing these things helps students understand the pieces they are learning, appreciate music more, and make better decisions regarding interpretation and artistry. Music camps are a perfect opportunity for getting submerged in music history and learning a lot in just a few days! When I took music history classes during college, my professor told us that one of her main goals was for us, by the end of the course, to be able to give a reasonable guess as to which time period a piece of music was composed — even when hearing a piece for the first time. I decided to adopt this very same goal for my students. Back by popular demand! This camp gives students a glimpse into the lives of four great classical composers. As we study each composer’s childhood and career, students will learn about the music, fashion, art, and architecture of the time. Every year, students are fascinated to find that they can relate to the life stories of composers who lived hundreds of years ago. In the long run, having this broader context of music history enriches later years of piano study, especially when playing classical piano literature. Each day, students will take home a crafted scrapbook page about that day’s composer. For students ages 5-14. Previous musical background preferable, but not necessary. Seven of my students registered for this camp this year, plus I had a high school student volunteer as my helper. For this camp, I always use my Great Composers and Their Music lapbooking curriculum. Each day of camp, we study a music style period (Baroque, Classical, Romantic, and Modern) as well as a particular composer from that time period. This year, we learned about Bach, Beethoven, Chopin, and Prokofiev. As I informed my students on the first day of our camp, the goal of the week is to be able to listen to an unfamiliar piece of classical music and identify the style period (or, at least, take a good guess). This is the same goal that my college professor had for us during the first semester of music history class. Younger students can do it too! Here, my students are cutting and assembling their lapbook about Bach. Meanwhile, they are listening as I tell the story of Bach’s life and music. We also discussed the general characteristics of the music from each style period. I used material from my Eras of Music History Kit for this. Each day, we had a listening quiz game where we listen to pieces from a YouTube playlist with the goal of identifying the style period we hear. My students got pretty good at this by the end of the week. To read more about the general lesson plan I use for this camp, click here. My students and I are in the middle of Music History camp this week and having a blast! This year, I’m teaching 5 girls between the ages of 5 and 8. Yesterday, we studied Handel (using my lapbook curriculum) and the Baroque Era. Today was Haydn and the Classical Era. We have two more days of camp to go, when we’ll be covering the Romantic Era and the Modern Era. Wish me luck! It is a lot to cover in just four 2-hour classes, but I am pleased with the information my students are absorbing so far. This camp will serve as a good first introduction to the stylistic periods of Western music! I ordered my shirts from CustomInk.com again this year. I was happy with the quality of the shirts last year, but more importantly — I love that CustomInk has an artist check your design before it gets printed. My design required slight adjusting to make it work properly for both adult and child T-shirt sizes — so it was a good thing they checked everything over before the shirts were printed. I haven’t shared much about my summer music camps yet — and they are coming up soon! During this camp, students will benefit from focusing on arguably the most essential element of music: rhythm! There will be lots of opportunities for group music-making, using body percussion (clapping, snapping, tongue clucking, etc.) and hand-held percussion instruments. Throughout the week, we will also complete workbook about various aspects of rhythm (pulse, time signatures, rhythm values, etc). For students ages 6-14. Back by popular demand, this camp will give students a glimpse into the lives of the four different great classical composers. As we study the composers we will be not only listening to the music of each time period, but also looking at the instruments, clothes, and art of each time period in order to make the past come alive. Each day, we will focus on a time period from music history and create a scrapbook page of pictures/notes to take home. It will be similar to last year’s music history camp, but we will cover four different composers this year. Campers will be sure experience the thrill of a blast from the past during this music history camp! For students ages 6-14. Join us for a journey around to world to study the music of different cultures! Campers will travel to four different countries to learn about each culture, music style, and musical instruments. Students will complete a workbook and craft their own musical instrument each day. Join us for this adventure! For students ages 6-14. Are you planning any summer music camps this year? If so, please share about your camp plans in the comments below! One of the camps from last year that I will definitely be repeating this summer is Music History Blast From The Past. I plan to use the same format as last year, but I will be focusing on different composers. In case you are considering the possibility of offering a summer music camp or two, I thought I would share more about how I planned my music history camp last year. I recommend group sizes of 3-8 students (5 or 6 is probably ideal). Students will be most comfortable working at a table; however, the floor is acceptable too. The lesson plans below are written for a 4-day camp that meets 2 hours each day; however, if you wish to incorporate other activities you can certainly change them. I do recommend planning on 20-30 minutes to study the musical time period, and an hour-and-a-half to complete the composer lapbook. If you wish to do a 5-day camp, a fun thing to do on the 5th day would be to have students present about the composers/time periods to the parents. 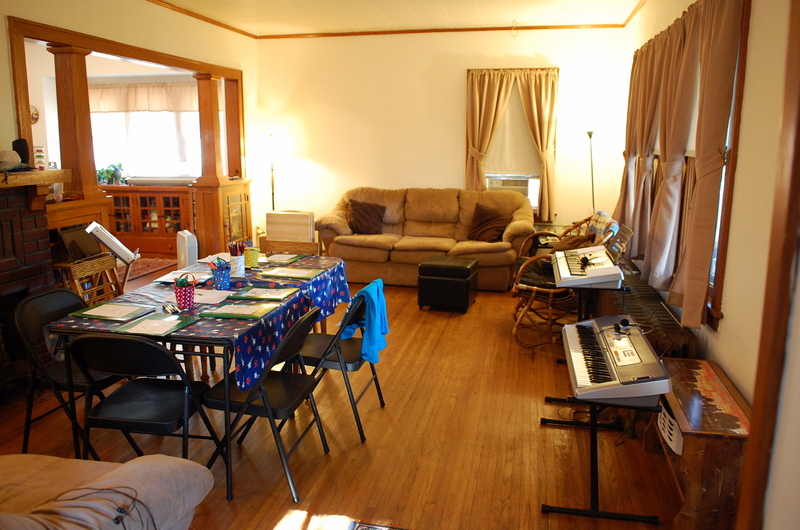 Last week, I held my second summer music camp for my piano students! 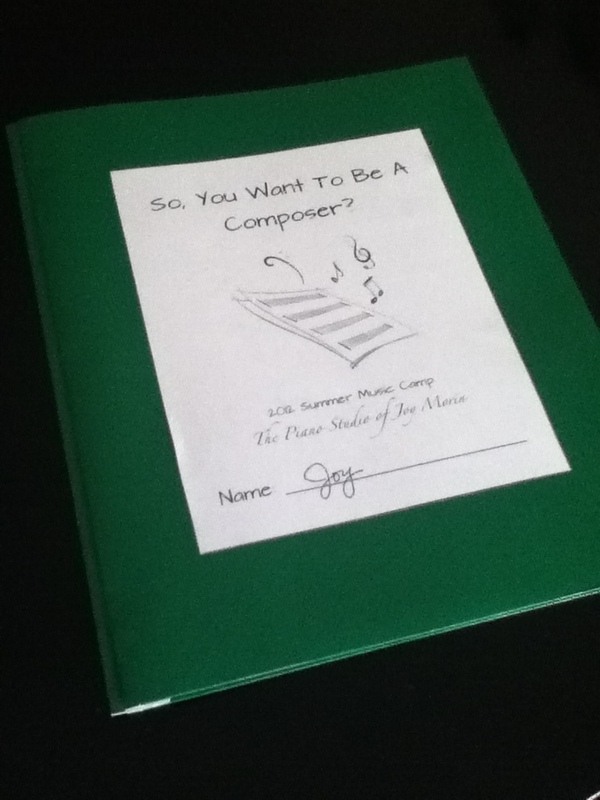 It was called, “So, You Want To Be A Composer?” I am so excited to share with you some details about our camp. We had a really great week! Here’s some photos to enjoy from our final day of Musical Olympics Camp. Since it was our last day, I invited the students’ parents to come and watch our last hour of camp. We re-played a few of our favorite games from the week, and also had an Olympic Awards Ceremony. More details below. We had great weather on Day 2 of our camp last week! Last week, I held a Musical Olympics camp for my students and it was a great success! We had such a fun week and I received a lot of positive feedback from the students and parents. I will definitely continue doing similar camps in future years! We met two hours a day, Monday through Thursday. I set the time for 10am to 12pm, which was perfect because camp was over before the weather got too warm in the afternoon. We were outside for all the games and activities, except for Monday when we encountered rain. I was able to convert some games into indoor games which we did in my garage. For Day 1 of camp, my wonderful friend Loretta (who lives a couple of hours away) came for a visit to be my camp helper! It was great seeing her again.